we have filled our limit. Burpham Village Hall is located in the heart of Burpham Village adjacent to both the Village church of St. Mary and the George Pub. It is situated overlooking the Sussex Weald towards Arundel Castle and fronts the village cricket pitch. Nestling in the South Downs National Park, Burpham can be reached 3 miles along a country lane just off the main A27 coast road and near to Arundel Railway Station. Our postcode is BN189RR. 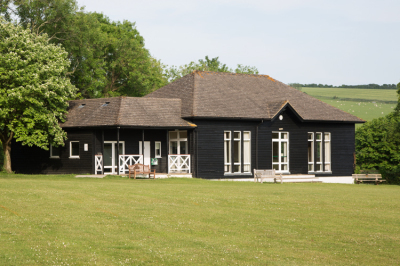 The village hall opens onto the village green overlooking the cricket pitch and Arundel Castle. This is an ideal location for a marquee or other outside event such as hog roast or BBQ. We don't allow music events in marquees, however. Music must be played within the Hall. The hall is available for daytime groups and clubs throughout the year, but we only take large group bookings between 1st May and 30th September. We take a limited number of wedding bookings, so for 2019 bookings, please contact Julie Tester on 01903 883053. We have 12 rectangular tables (seats up to 8), 6 round tables (seat 8-10), and 100 concert style chairs. ​We have a well-equipped kitchen with a serving hatch into the main hall. Inside the 3 mtrs x 4 mtrs kitchen is a double oven electric cooker with an induction hob with 5 heating rings, professional electric plate/food warming cabinet, a commercial dishwasher, a kitchen sink and handwash sink. A large American style refrigerator is available as are the hot water and hot water urn. We have an integrated sports changing room with showers for sporting clubs. There is disabled access to all areas. There is a large adjacent car park which is shared with the village as a whole. The cricket pitch area can be made available for parking by prior arrangement. No overnight parking is permitted. A 3.5 day large group hall booking package of £1200. This includes two days (typically Thursday and Friday) for set up, a day to celebrate, and half a day to pack up. An additional £350 will be charged on the large group package if a marquee is to be set up. The size and placing of the marquee must be agreed in advance with the Hall manager. The marquee must be cleared by 12 noon on the last day (usually Sunday). Some 2019 dates are already booked. For a list of dates currently booked with the Hall, please see here. For full Terms and Conditions for all bookings from 15th June 2018 please click here Please note that a marquee is included under the definition of 'premises' in the Terms and Conditions, so that restrictions on noise, for instance, also apply to the marquee. Additional requirements may apply to the marquee, such as flooring, so please ask Julie Tester. Insurances and Licences : The village hall is licensed with the Local Authority and carries Public Liability Insurance.